One out of five nurses will leave the nursing profession within the first year of becoming a nurse. 36 % of hospital nurses said their patient workload caused them to miss vital changes in a patient’s condition. You know what this is all about. You have arrived to your unit with call bells buzzing before you even get to the charge desk. Shift change report is a desperate attempt to pass on everything that happened and a prayer that you will survive. Sick calls come in regularly and mean you will again be doing the work of two people. This article won’t address the scope of issues with nurse/patient ratios and safe staffing, but it can give you 5 simple tips to get you through one of those days. If you aren’t in control of your day, nobody will be. Make a plan for success — not just survival. You know your best plans will be shot before report is done, but a plan gives you a place to return every time you take a second to stop. Instead of letting the day (or night!) run away from you, keep up with the pace by setting your own routine. A routine is as simple as “When I do A, then I do B. After B is done, then I do C”. When you start your shift, you do vitals and assessments on each patient. Then you do blood glucoses and hand out meds. You might be interrupted 20 times during your routine by a question from a patient, doctors’ calls, upset families, codes, and mishaps, but each time you deal with the interruption, you return immediately back to your routine. Routines will allow you to get twice as much work done in half the time. Routines cut out the “Stop and think what I am doing” minutes. You are only one person, although a pretty amazing one if you are still working in health care! However, amazing or not, you are not a superhero. You can’t fly (as much as your patients may believe you do). You don’t move at super speeds. You can only do what you are physically capable of doing. Know your limits. Instead of trying to do it all, focus on what your priorities are. Even go as basic as the ABC’s of your first aid training. A – Everybody has a functioning airway. You are doing well. B – All patients are still breathing. Now you are winning. C – There are no active bleeds at present. Gold star! Superhero Tip: Arrive to your shift 5 minutes early, find a quiet corner, and make yourself a list of which tasks are CRITICAL to your shift. Focus on those; run them by your supervisor if need be. Get the jobs done first that you hate doing the most and take the longest amount of time. You will look like a SuperNurse! When you can’t do it all, make a point to ask for help. Experienced nurses know that today may be crazy busy for you, but tomorrow you will have some breathing space. Ask for help today and tomorrow return the favor and help out a colleague when you have an extra minute. Many hands do make light work! Health care professionals that work together as a team can handle intense situations with ease. Your charge nurse, your CNAs and the other nurses are the support you will need to survive. Pair requests for help with compliments and gratitude, and your day will feel like a party (or at least, not as bad). Superhero Tip: Delegate. Assign appropriate tasks to the CNAs and do so kindly. Help when you can, but relax and let your co-workers excel at the task you sent their way. It makes work easier when you aren’t trying to do it all yourself. Chaos invites chaos. It’s the rule of small children and nursing! If one area of the day is chaotic, it all starts to swirl madly into a giant mess of screaming children and overflowing toilets. Plan for your day to be busy but calm. Don’t leave your work area scattered with charts, pens and sticky notes. Instead, take 5 seconds to close and re-shelve charts, put your pens away, and file the sticky notes where they belong. An organized work area will set the tone for the day. Often when we are overwhelmed, it is not because of the amount of work we have to do but the chaos. You can’t control the chaos of screaming patients, late surgeries, and 3 new admissions. However, you can create calm in your workspace, your notes, and your supplies. That will help bring more calm to the crazies you are dealing with. Superhero tip: Restock, put away and limit multitasking. Unless it is a life or death situation, always take time to refill supplies on the go. 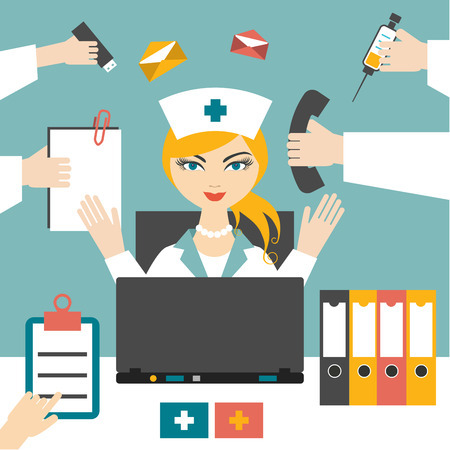 A full supply cart drastically reduces the stress level of your nursing team. Put things in their place. Your mother would be proud. Just say no to multi-tasking. You aren’t that good at it anyways, and it just makes your brain feel like it is exploding. You actually are faster doing one task at a time. When your shift is done, let it be done. Nobody is paying you to think about your patient with the pulmonary embolism for the next 5 hours, and you’re not helping your patient either, unless you remember something vital and call into the unit and save the day. In order to have enough energy for your busy shifts, you need to be able to shut down when you leave. Save your important brain cells for when you are on shift. When you are at home, use your brain for home stuff. If you can, leave your home problems at home and your work problems at work. Watch a funny show (No, not Scrubs or House Not even Grey’s Anatomy). Your home time is your time to think about home stuff and forget hospitals exist for a little while. Write in your journal. Leave out patient names but get all your feelings and frustrations out. When you write something down, it allows your brain to let that thought go. Superhero Tip: Remember you won’t be able to fall asleep once you get home, no matter how tired you are. Your brain is still rushing. The pressure won’t stop. You need to train your brain to switch gears. The way we train our brains is through routines and habits. Make a habit of relaxing when you get home. The answer to the question “How will I survive?” is simple to say and hard to do. If your days are non-stop already, then just add one new practice to your day. Try writing down what your routine will be. Tuck the note in your pocket. See what happens when you take control of your day and plan for success. Would it make your shift better?